When the Club first started up, we produced a newsletter about every 6 months. Unfortunately, after the first three issues, no one seemed to have the time, energy and/or skills to continue with it. In all fairness, it is a huge amount of work and we are all busy people. However, the first three issues were full of Club news and other useful information. We have reproduced the best of those articles here. For current news, please see the Club News page. The Chinese Call it "Chi"
"How do I know So and So is really a Such and Such Master?" Club News: Club's First Year a Huge Success! The purpose of the club is to provide a support system for continued Tai Ji group practices and related activities. As many of Diane's Cape students, past and present, as we could get addresses for have been sent this first newsletter, and we hope that everyone will join the club and participate in its activities as much or as little as they wish. The dues we pay ($15 per year) will be used to cover printing and mailing costs, bank charges and other miscellaneous expenses that are bound to crop up. In addition to dues, we plan to collect $10 per month to attend practice sessions ($5 per session if you want to pay by the session). These fees will cover the rents for practice space. Through the efforts of several people, we have a pretty nice practice schedule set up (see the box at the bottom of the page) that should meet the needs of most everyone. However this is not set in stone. If you can't attend any of the scheduled practices, let us know what would be a good time for you and if enough people ask for the same time we can set something up. People who have not finished, anyone who would like to learn a weapon set, and new people who want to start Tai Ji can also join the club and come to practice sessions to get instruction from more advanced club members. We envision this venture as a cooperative effort-everyone learning from and supporting everyone else. And don't forget, Diane is a member (the first one in fact) and will be attending practice sessions when she can and of course will be able to correct us all. We have set up the structure of the club to be very simple and flexible. In other words this club can go in any direction the membership wants to point it in. Our first business meeting will be at Diane's thank-you party (see the announcement elsewhere on this page) so come and have some fun and bring your ideas for the club. The newsletter will be published three times per year and will contain a schedule of Tai Ji practice sessions, upcoming special events, minutes of business meetings, and tidbits on Tai Ji and Wen Wu (educated wisdom with martial arts skill) from various sources. In this issue see The Ancient Poem of the Universal Post from the Tai Ji Boxing Chronicle. But... to be involved with any of this wonderful stuff, you have to join the club! So fill in the membership form accompanying this newsletter and send it in right now! In fact, if you would really like to help us get off on a firm footing, join-up by taking the dues-plus-a-full-year-of-practice-sessions option for $100. This will actually save you money if you plan to go to practice sessions every month, and it will really help the club treasury stay in the black while the club gets up to speed. If lots of peole join and all goes well, we may be able to reduce dues and fees significantly next year-we'll have to wait and see. This poem is related to an exercise that entails no movements. It is practiced as a still posture which is held for one hour a day after the practice of the forms. It is standing meditation and expresses mind over body. Where Did the Name "Crane's Cry" come from? During one of Master Chiang.s lectures a student asked why there is an audible exhalation with the downward punch. He answered that this breath serves to eliminate any excessive build up of fire and that this kind of breath is called "He Wu,"--"Craine's Cry." Go back to the article menu. Club Gets Off to a Great Start! The Cape Cod Guang Ping Tai Ji Quan Club seems to have gotten off to a terrific start. We now have 37 members, ample funds to pay all our rents and other expenses through the end of our first fiscal year, and 4 practice sessions in three different locations. Several new beginners have joined the club and attend the Tuesday morning practice session led by Geoff Way. In October we had a well attended pot-luck dinner party for Diane at the home of Denise Backus, which started out with Tai Ji to whet everyone's appetite for the the wonderful feast that followed. After dinner we had our first Club business meeting at which we ratified a set of By-Laws to serve as our organizing and operating document; voted to spend $150 to apply for non-profit status under Section 501 C(7) of the IRS Code; voted approval of the wording of a contract with the World Gym in Mashpee for Thursday night's practice session; and elected Jen Kano and Denise Backus treasurer and assistant treasurer respectively. The meeting concluded with the presentation of a gift to Diane in appreciation for her many years of dedication to teaching Tai Ji in the Falmouth area. The gift was an 18" round platter by ceramic artist Dan Kummerer of East Dennis commissioned by 29 of Diane's students with a design of shadow figures in "wring the moon," and "single whip moving down." On December 10, the Club did a Tai Ji, sword and fan demonstration at the invitation of the Unitarian Universalist Fellowship Religious Education Youth Group as part of their study of Taoism. Participating in the program were club members Geoff Way, Jen Kano, Joanne Gilbrook, Shirley Setian, and Laura Richard. After the Tai Ji part of the demonstration there was a lively exchange of questions and answers between the young people and the demonstrators. Practice sessions are of course the main activity of our club. The Tuesday morning Falmouth Recreation Building session is the best attended with a high of 15 one day and 19 people attending at least once during the month. Diane and Michael have been attending when they are in town, mostly in Woods Hole on Wednesday mornings. All those who attend greatly benefit from her expert corrections. She has also been teaching the kicks (you know, the ones on the 30 basic exercises list) to those who want to learn them. They are after all, they are an important part of our Guang Ping basics as well as great exercise for increasing stamina. We should all consider taking advantage of the opportunity to learn these kicks when Diane is around. On Diane and Michael's recent trip to Taiwan and California, they had an opportunity to get some correction themselves directly from Master Chiang. They passed these corrections on to the club in detail at one Wednesday and one Thursday practice session. It was the next best thing to getting corrections from the Master himself! 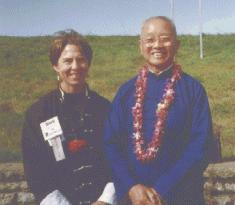 Diane Hoxmeier with Master Y.C. Chiang. We call ourselves members of the Cape Cod Guang Ping (Yang) Tai Ji Club. We know what Cape Cod means but what about Guang Ping (Yang)? If you haven't heard the story let me try to explain these three words that often appear with our special tai chi form and gave it and our club, its name. Since I have become more familiar with the Chinese language, maybe I can save you some time. It took me two years to just member how to say Guang Ping Yang style tai ji chuan, let alone, know what it meant! Part of the problem is the Chinese language. It has a great number of homophones, that is, words that sound the same but have different meanings. In English, blue and blew, and knot and not are common homophones. Another problem is rendering Chinese into English letters/words to try and mimic the pronunciation. And then there's the fact it's a foreign language which include sounds we never use. With this in mind, let me begin with Guang Ping Yang. Guang Ping is a city in He Bei province in China (PRC) like Falmouth is in Massachusetts in the USA. Guang means broad, as in broadcast, and is written (as seen on the letterhead above on the left) with the radicals (word parts) for "shelter" and "yellow". It has 15 strokes. This character is hard to say and is often transliterated different ways (guan, kuang, kuan,), Ping is composed of four strokes and is classified in dictionaries under the "shield" radical. It means level. Another ping, written differently, means bottle. We do not do the broad bottle tai chi form. HeBei (Hebei) province means "River North" (or, as we would say, N. River province). Guang Ping is about 370 miles south of Bei Jing (N. Capitol), also in Hebei province. (On some maps, it is written Hobei.) There is also a S. River provence, a N. Lake provence (Hubei), and a S. Lake provence. Yang Lu-Chan and his son Yang Ban-Hou lived in Guang Ping city. Mr. Yang's name means poplar tree, and is also a common family Chinese name. Although not shown here, it has the wood radical on the left. It sounds like the yang of yin and yang but they are written differently (although they look similar) and mean different things. We can trace a lineage of our form to the Yang family. Mr. Yang lived in the 1800's during the Ching Dynasty. Mr. Yang was a great martial artist who was the first person to learn tai chi ch'uan from Mr. Chen. At that time, forms were kept in the family and kept secret. Chen is also a family name and is written with the "mound" radical on the left and the word for east on the right. Mr. Yang adapted what he learned from Mr. Chen. Chen's style and Yang's style look different. They are both taught today but Yang style is much more prevalent. Our Yang style, though, is different than other Yang styles seen today. How is this so? Emperor's guards because they were Manchurian and not Han, i.e., not really Chinese. But he had to teach them something. He taught them a watered-down version, sometimes called Beijing Yang style. Guang Ping is used to describe our tai chi form to distinguish it from the Beijing Yang style. The most widely known Yang style in this country is that which was first introduced by Chen Man-Ching about 40 years ago. So here is a Mr. Chen who taught a Yang style! Is this getting confusing? Anyway, we refer to our form as a Guang Ping Yang style form of tai chi, or a Northern style, and it has 64 moves. It is rare and traditional, in that efforts have been made not to change (simplify) it and draws from a strong foundation (i.e., the basic exercises.) Our Guang Ping Yang style of tai chi has not been taught in the PRC for a long time. But students of Kuo Lien-Ying, and students of his student, our Shur Fu, Y.C. Chiang (Jiang), have spread in this country and our form has become more recognizable. Just this year, Guang Ping Yang style has become its own category in tournaments. We do a Yang style that no longer needs to compete in the Yang category! Guang Ping Yang style tai ji quan describes a place and a family lineage of our tai chi form. But, aside from having 64 moves, how does our form differ from other tai chi forms? What features are unique and which ones are in common? And what does tai ji quan with all its myriad transliterations mean? Those are other stories for another time. It is the "life energy." The character depicts a pot of rice cooking. The steam or energy from the pot makes the lid move up and down--rather like life itself. "The same way you recognize any master," replied Mist Through a Grove. "A master is someone who has answered many questions for himself and can answer any question for the student...must be able to prove all he claims..must practice what he preaches--and it should show. He should be in perfect health, with bright, clear eyes and such an attractive aura that you find yourself wanting just to be close to him. Finally, a master unselfishly teaches and helps her student, and there seems to be no end to what he can teach you. That is a master." And asked him, saying, "Dead man, how as it"
Of the dan of Chuang; Chou was my name. My reason soared, yet could I not save myself! to the Black Hill of Death." Written by Chang Heng. Translated by Arthur Waley from Ivan Morris, comp., Madly Singing in the Mountains: An Appreciation and Anthology of Arthur Waley (New York: Walker, 1970), p. 176. Chuang Tze is one of the best known Taoist philosophers, after Lao Tze, and lived during the time of Mencius 1, about 400 BC. Club's First Year a Huge Success!! Happy Birthday everyone! Our club is now one year old and has grown beyond what anyone expected when we started out a year ago. We currently have over 70 members, run seven practice sessions a week, and have a sizable nest egg in our bank account. Here are some of the highlights of what has been happening since our last newsletter. Shortly after the first of the year, Geoff Way started teaching a class at the Falmouth Senior Center with over 20 students. A month or so later, he also started working with about 12 people at the Sandwich Senior Center. These classes added significantly to our membership, and both programs are still going strong. As a club we can be very proud of making Tai Ji available to Senior Citizens at low cost. Thank you Geoff for donating so much time for these classes, and thanks also to Joanne Gilbrook for "subbing" for Geoff when business takes him out of town. We have had a number of new members in our other practice sessions, too, several of which attend and practice regularly and are making steady progress. Many of Diane's students who had not yet finished with her, continue to progress with the club, and two of them, Laura Richards and Jane Barger finished this summer--they are the first two people to finish under the auspices of the club! Diane and Michael have been dropping in at practice sessions now and then, and we have welcomed Diane's expert instruction on these occasions. In February we came out with club T-shirts and sweatshirts designed by Jen Kano. They were all-the-rage with club Members immediately and we have already sold out the initial order of 100 and have ordered another 36 short-sleeved T's which are going fast. Thanks to Joanne Gilbrook for coordinating the second order. In early July, John Morash and Terry Tilton traveled to Winchester, Virginia and participated in several days of workshops at the "Taste of China" Tai Ji Seminar and participated in several days of workshops many of which were taught by Guang Ping Master Henry Look of Rancho Cordova, California. On the last day they also competed in the USA All-Taijiquan National Championships in the Guang Ping division. John brought home the fourth place medal and Terry finished seventh. They felt they had gotten so much out of the experience that they also attended the US International Kuoshu Championship Tournament in Hunt Valley, Maryland and somehow managed to talk Jen Kano into going with them. Again it was a wonderful learning experience, and John and Terry finished fourth and fifth respectively in the Advanced Guang Ping Division, and Jen second in the Intermediate Division (those practicing under 3 years). Congratulations to all three. As many of you have probably heard, there is a National Guang Ping Association forming headed by Master Henry Look. At their August 11th business meeting our own Diane Hoxmeier was appointed as one of 8 national advisors and was also appointed East Coast Regional President. Congratulations Diane! Lastly, many thanks to everyone who has helped with the administration of the club and/or helped run practice sessions: Geoff Way, Jen Kano, Denise Backus, Joanne Gilbrook, John Buskey, Paul Andrews, and John Morash. (Apologies for any inadvertent omissions and thank you, too.) And of course, many, many thanks to Diane Hoxmeier without whom there would be no Club or Guang Ping practitioners on Cape Cod.